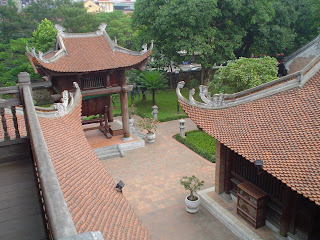 The Temple of Literature is in Hanoi, Vietnam. 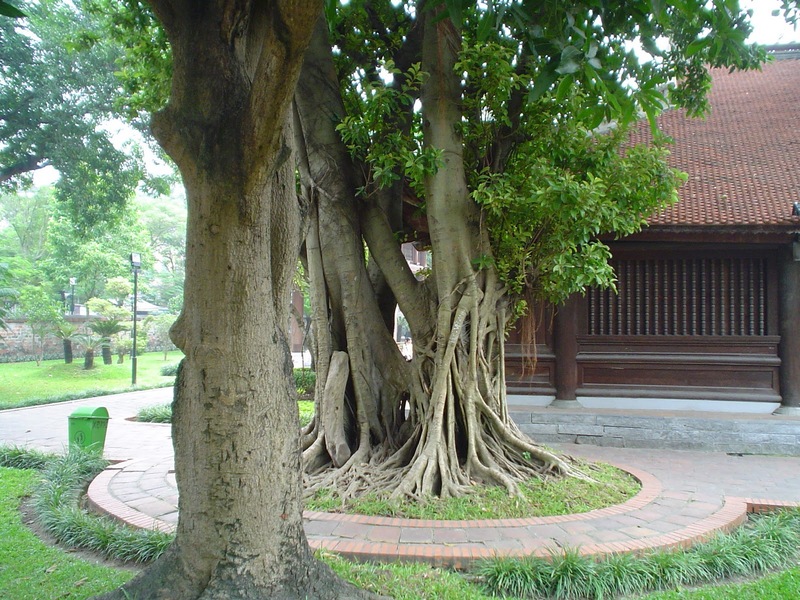 It's name is Van Mieu (Văn Miếu), which literally means the Temple of Literature. 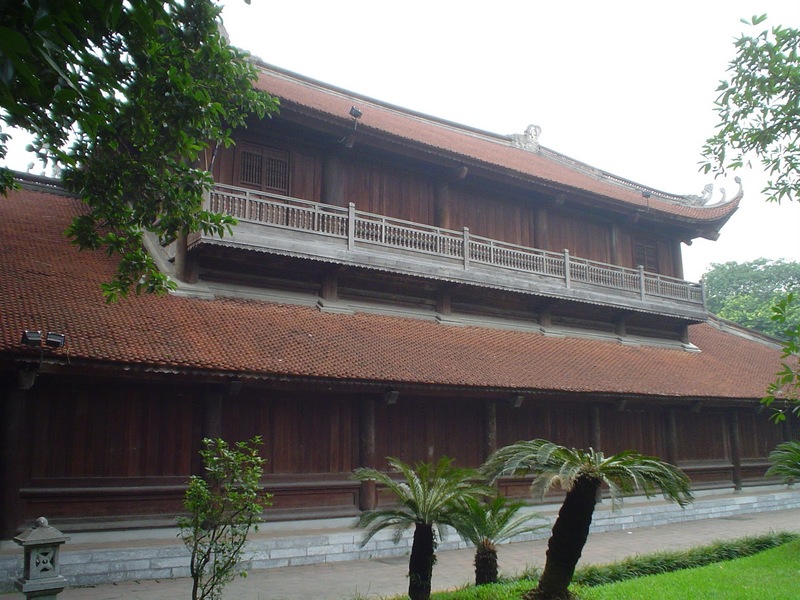 According to the book "Complete history of the great Vietnam", the Temple of Literature was built in honor of Confucius in 1070 by the king Ly Thanh Tong. 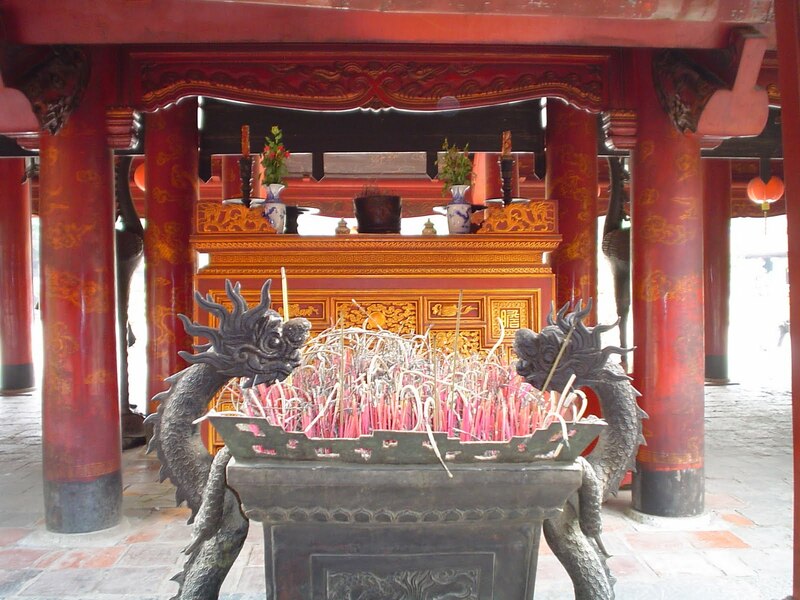 Although there are several Vam Mieu or Temple of Literature around the whole Vietnam, the one located in Hanoi is, without doubt, the most famous of them all. The reasons why this temple is famous are the Temple of Literature in Hanoi was also the first university of Vietnam or imperial academy by the year 1076. There they taught literary composition, Confucian classics, etc.. Noteworthy this place is one of the few places around Vietnam dedicated to Confucius instead of Buda, as Vietnam is mostly Buddhist. Initially the use of the university or imperial academy was restricted to the imperial family, nobles and royalty of the country. Later they allowed access to the country's most notorious students. The university functioned for 700 years and it is said that the difficulty was such that only a bunch of students were able to pass the exams and get full marks (graduated as doctor laureats). The name of these students, 2313 to be exact, were engraved in 116 stone steles for posterity. In the courtyards of the Temple of Literature in Hanoi today remained 82 of the 116 steles with the name of all those excellent students. The steles are placed on a stone tortoise (tortoise is the symbol of longevity in the Vietnamese culture). It is a tradition and omen of good luck, touch the head of all turtles, that is the reason why the conservation status of some of these turtles is not very good. The steles dated the first examination by the year 1442, and the last in 1779. The temple originally consisted of 5 yards, lined up one after the other, but after the French bombardment of 1947, one of them was destroyed. The entire perimeter is surrounded by brick walls, the most notorious part of the buildings are the roof, whose sharp edges are pointing up. The main access to the facility consists in two large gardens (a third garden is outside the brick perimeter), with small pools or lakes located in both sides, and also trees. 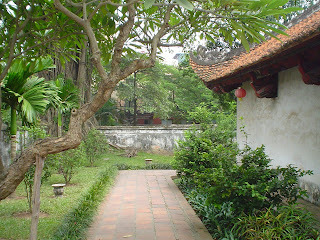 These gardens were used by the students to relax and forget the rush of the city outside the walls. Across the gardens, we will reach the central part of the complex, with small one-story buildings around a squared lake or pool, this time in the center. This part of the complex is called the constellation of literature, where resides the 82 engraved steles with the names of the students. The steles are, undoubtedly, the most valuable asset of the temple. The next part of the complex is the main hall, where statues of Confucius and his disciples lie. Behind the main hall, was formerly the university, destroyed by French bombs in 947. 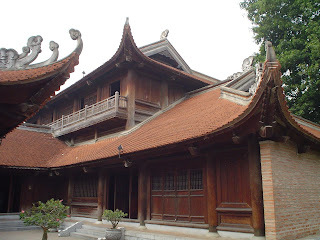 Side view of Van Mieu Temple in Hanoi (Vietnam). Main hall dragons. 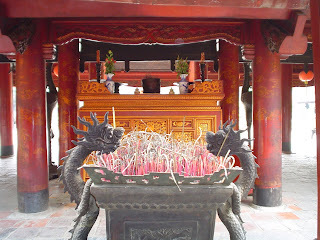 Temple of literature. Hanoi, Vietnam. Temple of literature's courtyard. Hanoi, Vietnam. 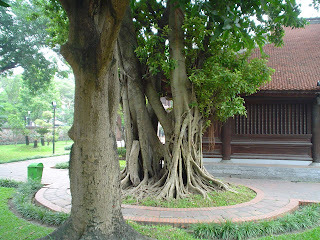 Another coutyard in the Temple of literature. Hanoi, Vietnam. 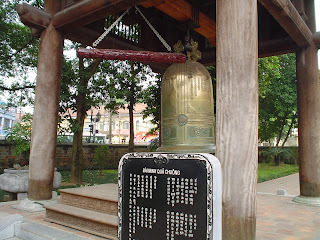 Another of the relics of the temple is a bell of the year 1768. Together with the bell we can find a tile with lyrics or melodies. In front of this bell, about 50 meters away, a huge drum. The exterior boundary of the Temple of Literature is built mostly of brick. 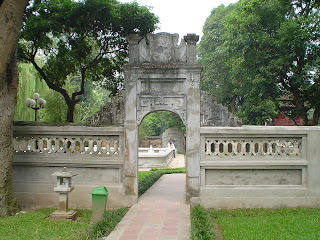 The access gate, reminds me to the doors to the pagoda which is located next to Hanoi's central lake, the Lake Hoan Kiem. The entrance has 2 levels, the lower level has 3 gates: a large central gate, for the king only, and two small side doors. The left door was for the king's advisers, and right one for the royal guard. At the top of the gate, on both sides, statues protect the temple from evil spirits and allow access to its interior to the good spirits. Main access gate to the Temple of Literature. Hanoi, Vietnam. This is the map of Hanoi's temple of the literature, by letras de viaje. Curiously, the temple of literature is printed on the back side of the 100.000 VND (vietnamese DONG) banknote. Its value is about 4€. This note is currently valid and widely used.